we look back on the year 2015 with joy because we are ever closer to fully establish and complete the children’s home in Maseno. Today, we would like to inform you what else our association achieved this year in close cooperation with our partners in Kenya. 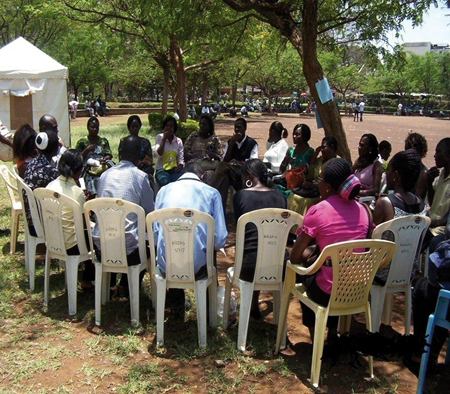 This year again, Austine Otieno and his team in Kenya campaigned to raise awareness and sensitize the public for Deafness in Kenya. 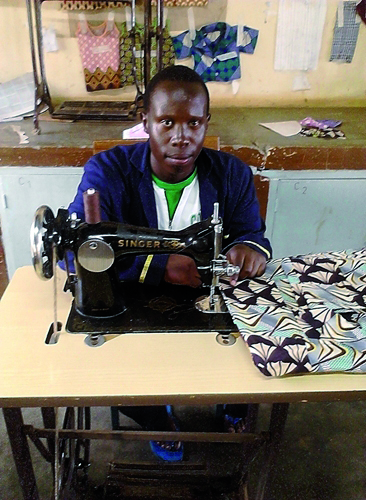 “We often go to churches and markets to disseminate information about Deafness”, Austine told us. 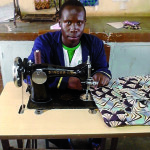 Austine and his team inform the public about the causes for Deafness and demonstrate how Deaf and Deafblind people can be fully integrated into society. “Especially learning sign language diminishes communication barriers”, Austine emphasized. 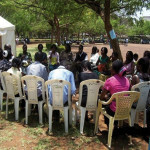 Unfortunately, last year the team in Kenya was not able to offer sign language courses on a regular basis. This was especially due to the high costs for renting a classroom. However, Austine was already able to solve this problem for next year: Starting in January, courses will be offered in the facilities of the Church for the Deaf. 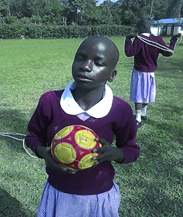 Last year, Austine formed a soccer team with Deaf students from Maseno. It was one of his goals to sensitize the general public about Deafness and to also make Deaf children more “visible” through these sporting events. 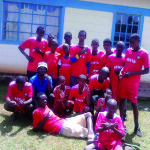 What is more, Austine wanted the children to feel more integrated into society through their participation in soccer games. 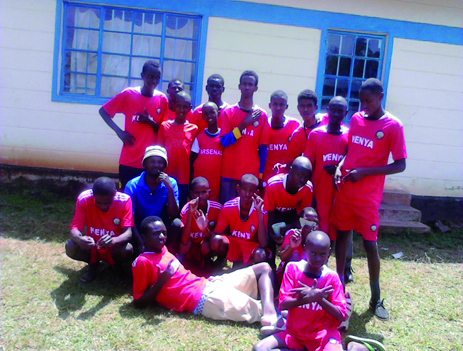 As a result, there are now 22 players on the school’s soccer team who regularly compete with teams from neighbouring schools. 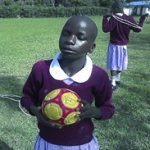 Because of this great success, Austine now plans further sport activities – especially for the Deaf girls at the school. This year, we were all quite busy with our professional and family lives. That is why we were not able to participate at the “Sonnenmarkt” in Mainz as we did in 2014. 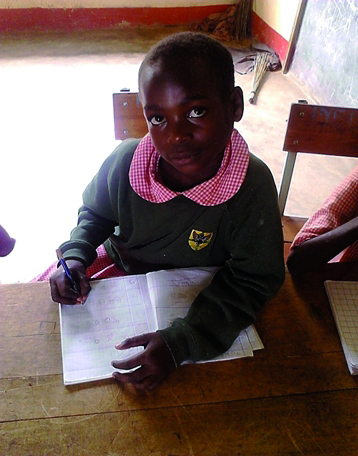 However, we all kept on pursuing our aim of sending the “Kids of Maseno” to school. We continue to inform our sponsors through our website and other reports (e.g. we contributed to the newsletter of our partner ELAN e.V. ), and we will continue this work next year. After some of the teaching materials were destroyed in a fire last year, we launched a campaign to replace the lost materials. It is due to your numerous donations that all materials could be replaced! We would like to thank you very much for your contributions! There are further good news on financial matters: The team in Kenya is now able to pay some of the running costs by breeding and selling rabbits, chicken and furniture from their own carpentry. We strongly believe this is a great achievement! Again, we would like to note: This was only made possible by your support! What is more, our building project advanced. Works on the first dormitory are completed, only the kitchen remains as a temporary solution. Thus, the first children were already able to move in and they made themselves comfortable there. Right now, ten children are living there. But there are many more children who would like to move in! For now, they are on a waiting list and they hope that construction of the second house will soon continue. 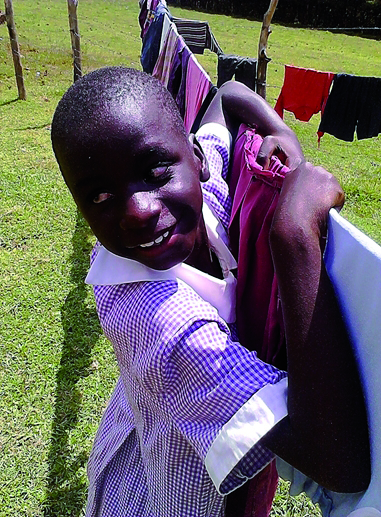 We do everything we can, so that other children will be able to move in as soon as possible. Once again, we rely on your help and contributions! Sponsorships are one of the most important pillars of our work. Still, many children depend on your support. Other projects, like the breeding of chicken and rabbits, only help to cover part of the running costs. That is why we hope that you will stay committed and continue your sponsorships and tell your friends and colleagues about Kids of Maseno! experience in working with children or youth with disabilitiesAgain, we would like encourage you: If you know anybody who fits this profile and who might be interested, please let us know! There are many good reasons to apply as an intern: A stay abroad in a beautiful country, working in close cooperation with teachers and children and improving your language skills. What is more, the school has a new headteacher and there will be more options for co-operations! The running costs of the children’s home but also the sponsorships are funded by our sponsors, members of our association and donations from private persons but also through the website betterplace.org. Next year, we want to launch another big project: We would like to start the construction of the second building of the children’s home. In the last five years, you have shown that we can reach this goal! That is why we would like to encourage you to support us again: Tell your friends, colleagues and families about our project. 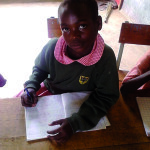 Kids of Maseno celebrates its fifth anniversary!